We've all seen that mournful look family pets give when they know you're going on vacation. 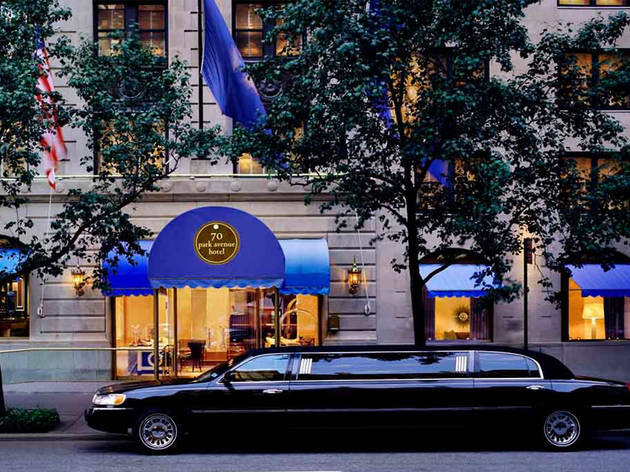 Thanks to these pet-friendly hotels in New York City, your furry family members can get in on your travels (and, for that matter, crash in style). Here's our list of favorites around town. This uptown boutique hotel boasts cozy rooms, Jazz-Age-inspired interiors and three bar and restaurant options—plus, four-legged guests are welcome. Bring up to two pets (40 pounds or smaller each) for an additional $40 per pet per night. 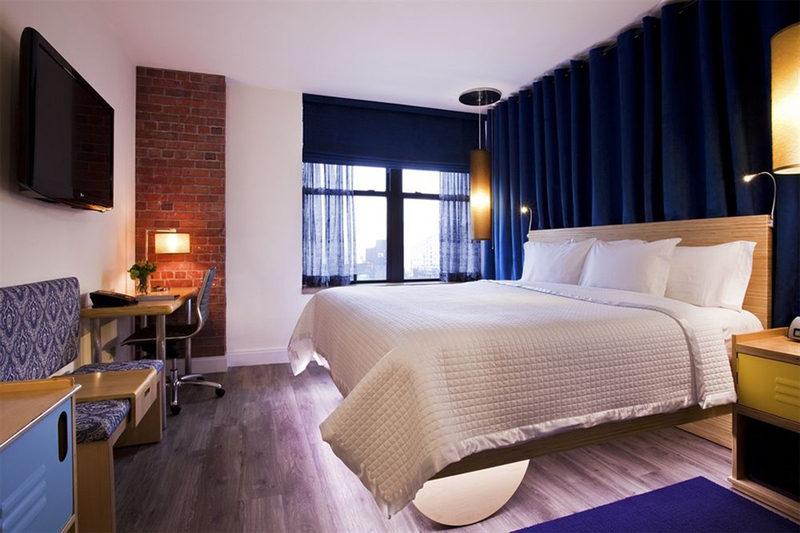 With the Dog Days at NYLO Pet Package, rooms that will be accommodating canine guests are supplied with extras like treats, a plush toy and a map of local dog-walking spots (like nearby Riverside and Central Parks). Plus, the $40 fee is waived. Find out if the pet package is available during your stay when you book online. 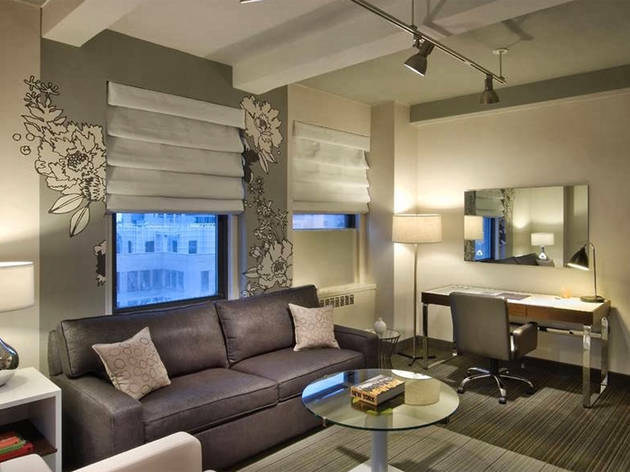 222 W 77th St between Amsterdam Ave and Broadway (212-362-1100, nylohotels.com/nyc). 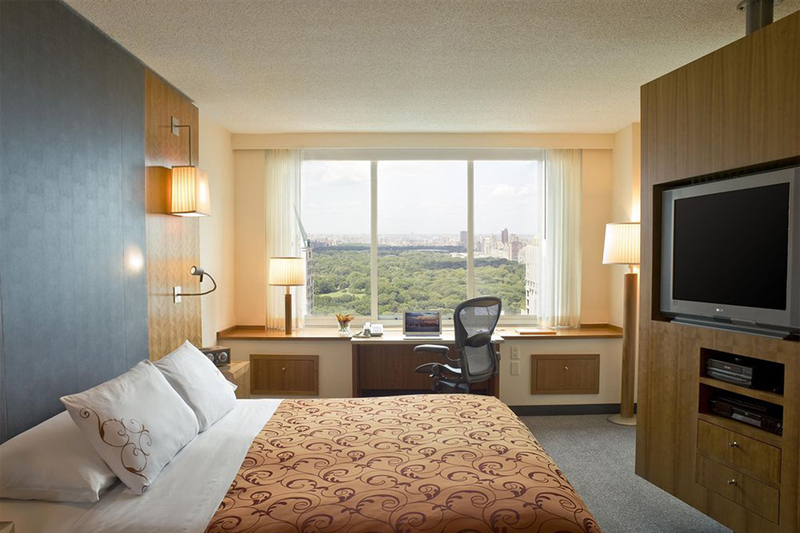 This classic midtown hotel has accommodated more guests throughout its nearly 100-year history than any other hotel in the world. 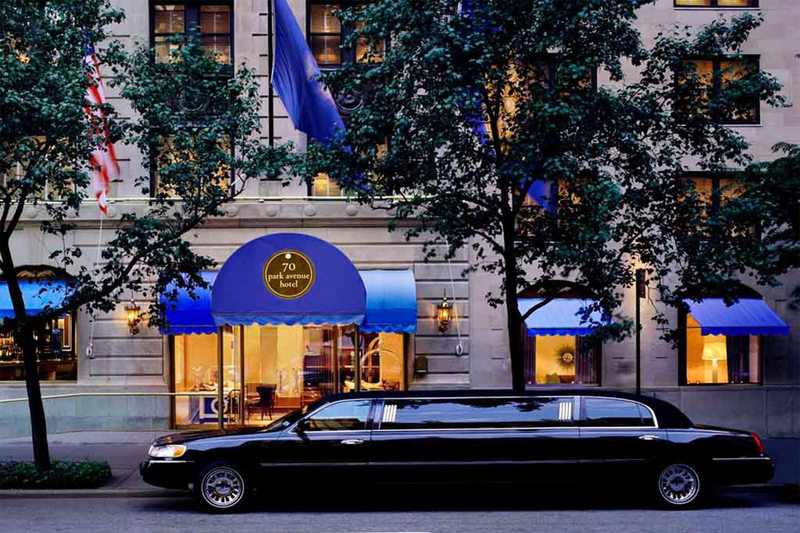 Among its patrons are some very high-class pooches—it’s the official host hotel for the annual Westminster Dog Show. Even if your pup isn’t pedigree, he’s welcome to join you. The Penn Loves Pets package includes a welcome treat upon arrival, a copy of FIDO Friendly Magazine and a coupon book for local stores. Guests are limited to two dogs per room and must pay a one-time fee of $25 per room per pet per stay. Big dogs are welcome—there’s no weight restriction on pups at Penn. 401 Seventh Ave between 32nd and 33rd Sts (212-736-5000, hotelpenn.com). This Kimpton Hotel in Murray Hill has one of the most permissive pet policies we’ve come across. Guests are welcome to bring pets of any size—as many as they want—for free. That’s right: no extra fee or non-refundable deposit required. 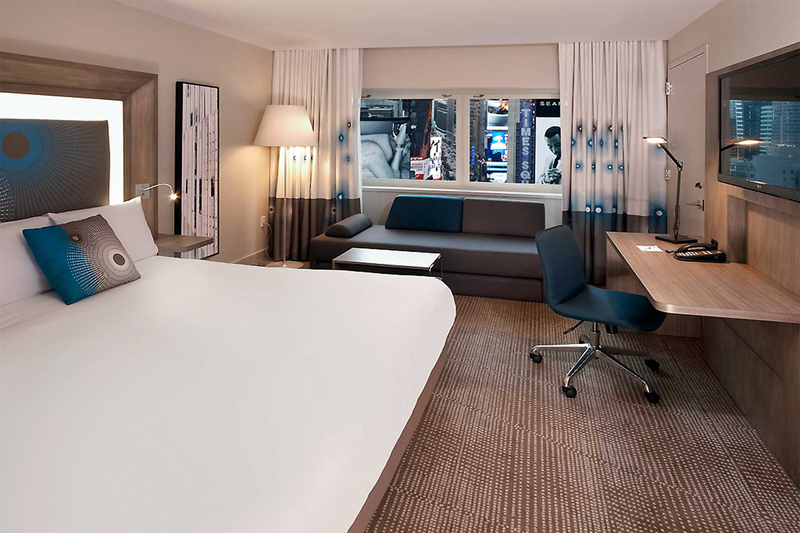 If you arrange to bring your furry friend, your room will come complete with a pet bed, food and water bowls and disposable waste pick-up bags for use during your stay. You can even set up pet sitting or dog walking services through the hotel’s concierge. The only rule is that pets are designated to certain floors; fill out a pet registration form when you book online. 70 Park Ave between 38th and 39th Sts (212-973-2400, 70parkave.com). 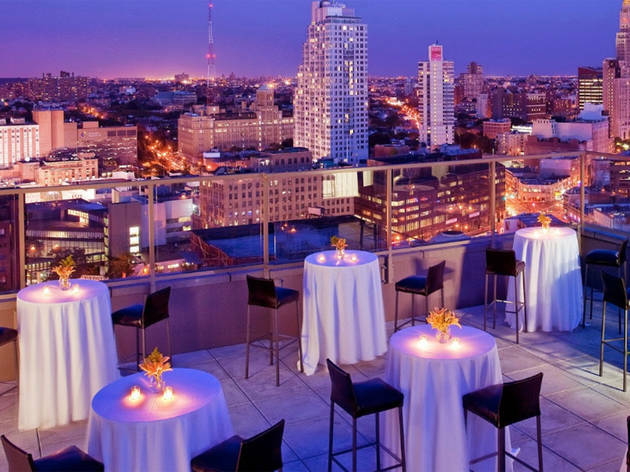 Located in downtown Brooklyn just a quick jaunt over the bridge from Manhattan, this Starwood hotel offers several types of rooms, from basic accommodations to luxury suites. 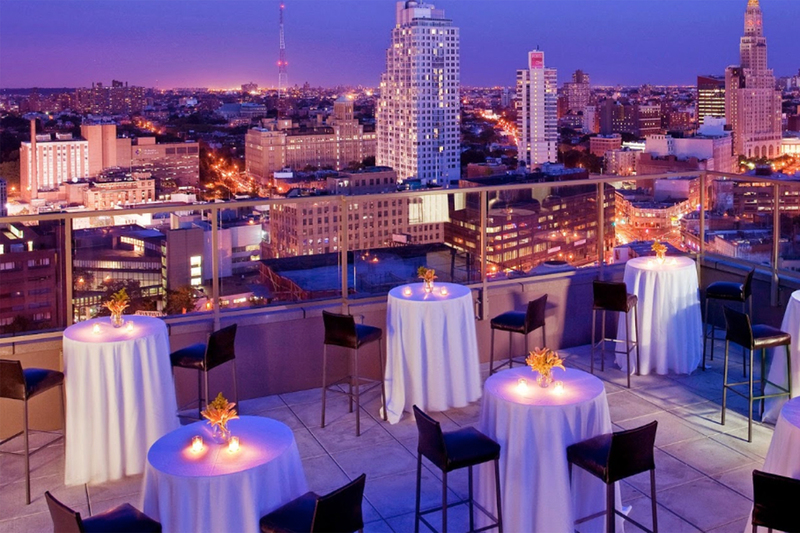 Enjoy the views from the rooftop Brooklyn Terrace or take the kids for a dip in the heated indoor pool. Your pets are welcome to stay with you free of charge, provided they weigh no more than 60 pounds. 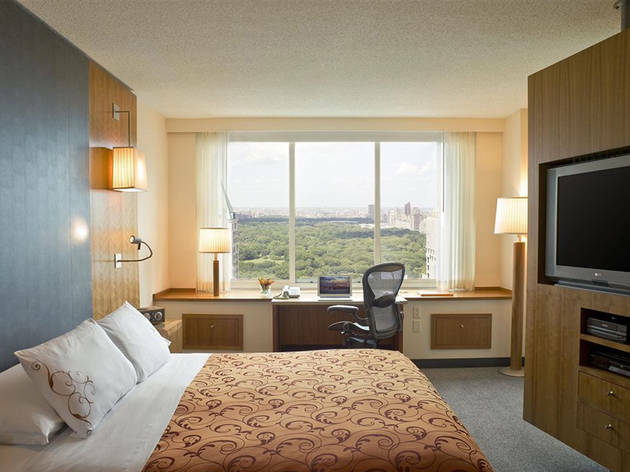 228 Duffield St between Fulton and Willoughby Sts, Brooklyn (718-855-1900, sheratonbrooklyn.com). 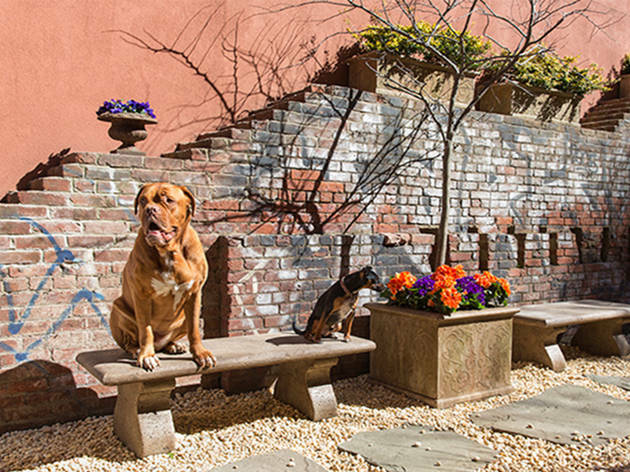 Animals aren’t just welcome at this Chelsea boutique hotel—they’re treated like royalty. For an additional $50 you can take advantage of the VIPaws pet program, which includes amenities like food and water bowls, a comfy pet bed and your choice of toy from local shop Jax & Bones, treats, waste bags, a dog-friendly walking map and coupons for discounts at city pet stores. You can even get dog stairs, in case your teacup pooch needs a boost. Best of all, your stay gives back—the VIPaws program includes a $10 donation to the Humane Society. There’s no size restriction for pets, nor is there a limit on how many animals you can bring, but dogs must be leashed at all times and are not permitted in the hotel’s bars or restaurants. 371 Seventh Ave between 30th and 31st Sts (212-563-1800, affinia.com/manhattan). All of the unfussy rooms in this pet-friendly hotel have kitchenettes with microwaves and sinks (some suites have full-size fridges), so it’s a hit with families as well as business travelers. 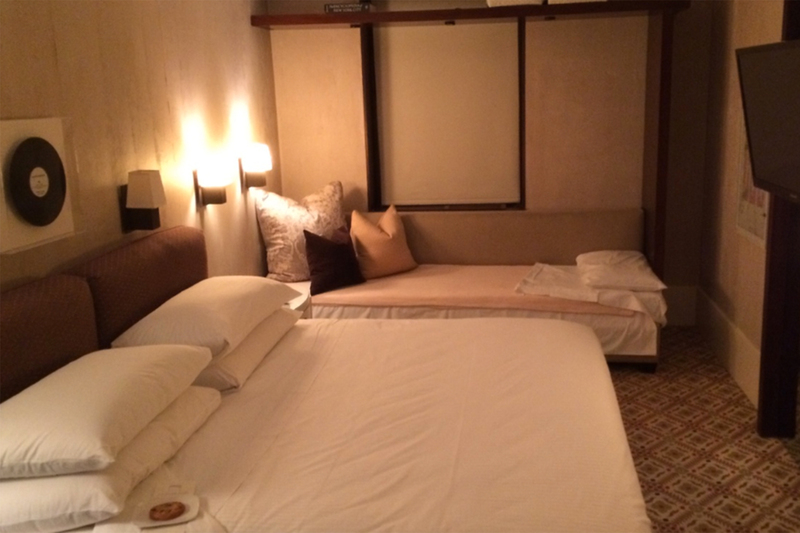 The emphasis is on comfort and relaxation; choose from a menu of pillows based on your preferred sleeping position or book a sleep consultation with an expert. The Benjamin’s recently-launched pet program, goodDOG, is a partnership with canine subscription service BarkBox; four-legged guests get a sample box upon arrival that’s packed with treats and toys. The program, which costs $50 per stay, also includes amenities like a collapsible water bowl, paw wipes, waste disposal bags and pet beds and bowls from Mungo & Maud. 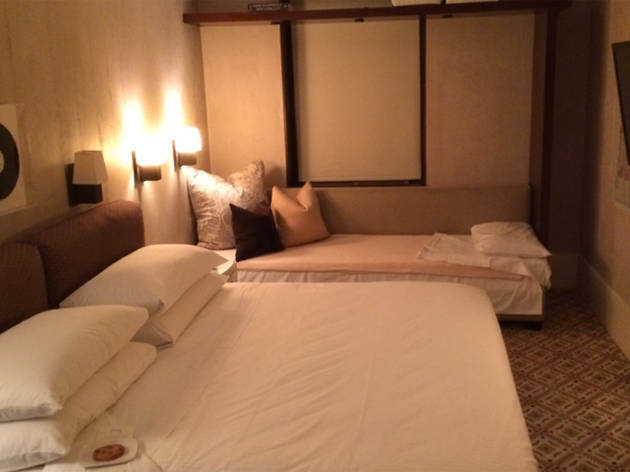 There’s even an in-room pet mini bar stocked with gourmet biscuits and non-alcoholic Bowser Beer. 125 E 50th St between Third and Lexington Aves (866-222-2365, thebenjamin.com). 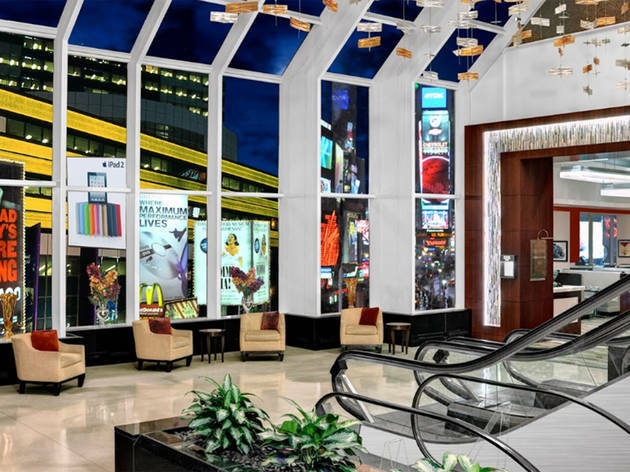 Located in the heart of Times Square, the Crowne Plaza welcomes tourists on four legs as well as two—provided they’re on the smallish side. 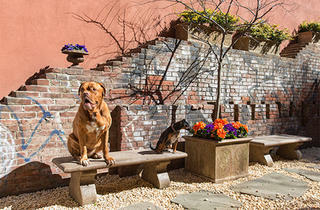 Guests can bring up to two pets 15 pounds and smaller for a nonrefundable fee of $75 per stay. For families, the hotel's restaurant, Brasserie 1605, has a kids' menu for guests 11 and younger. 1605 Broadway between 48th and 49th Sts (877-834-3613, cpmanhattantimessquare.com). 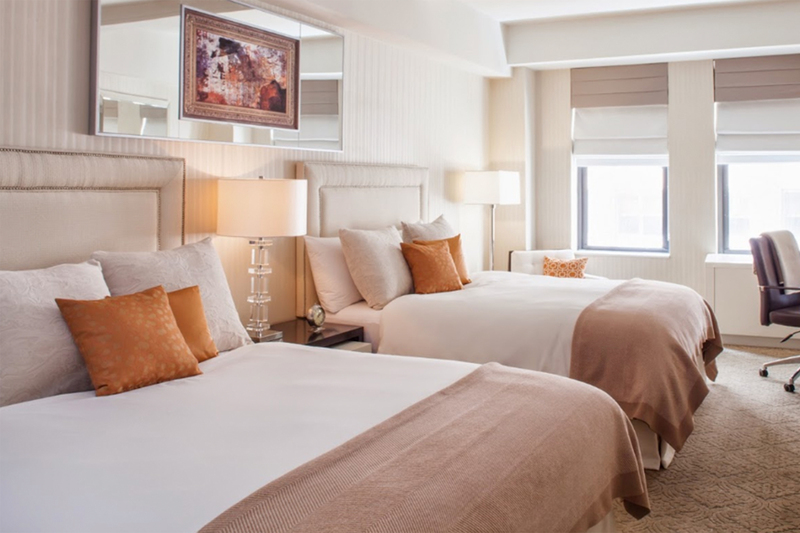 This cozy but luxurious 65-room boutique hotel in midtown pampers guests with Frette bedding, C.O. 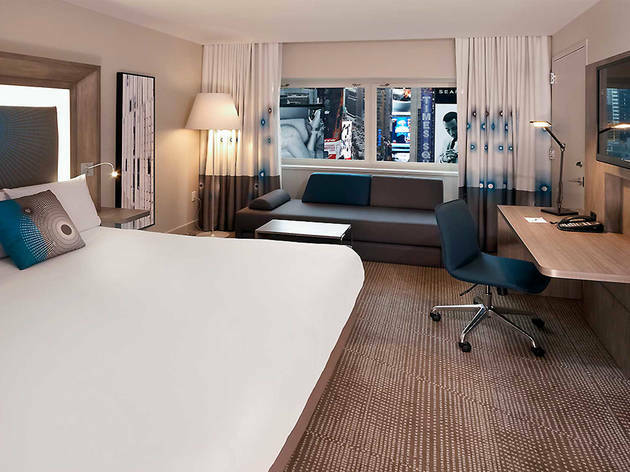 Bigelow bath products and 24-hour room service from DB Bistro Moderne (for those bedtime snack cravings). Make your comfortable accomodations feel even more home-like by bringing your furry companion along. 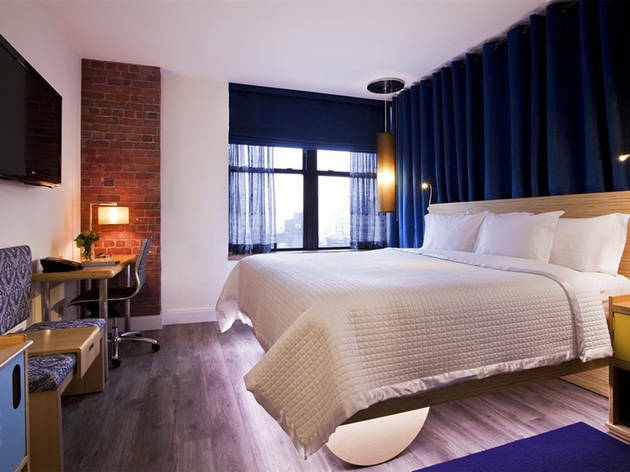 For a refundable deposit of $150 per stay—which you’ll get back upon room inspection when you check out—you can have up to two pets per room (less than 30 pounds each). 55 W 44th St between Fifth and Sixth Ave (212-921-5500, cityclubhotel.com). 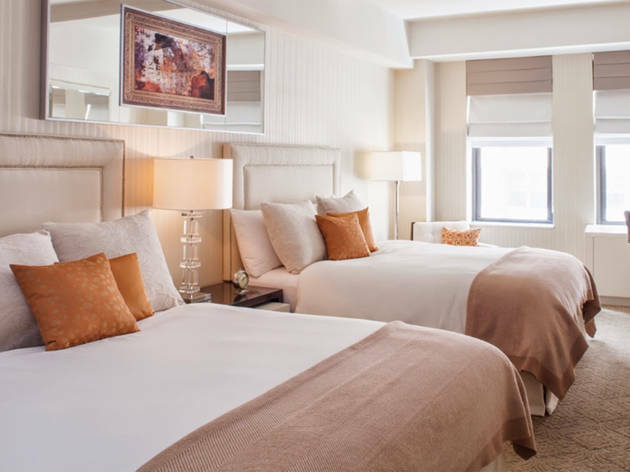 All of the rooms at this upscale hotel are more than 300 square feet, so whether you choose views of Central Park or the Manhattan skyline, you and your family (pets included) will have plenty of space to relax. You can leave your furry friend in your room while you get a mother-daughter mani-pedi at Le Parker Meridien’s esteemed Tenoverten nail salon; just leave your contact information with reception. Prepare to pay a $50-per-day cleaning fee, even if Fluffy is perfectly house trained. 118 W 57th St between Sixth and Seventh Aves (212.245.5000, parkermeridien.com). 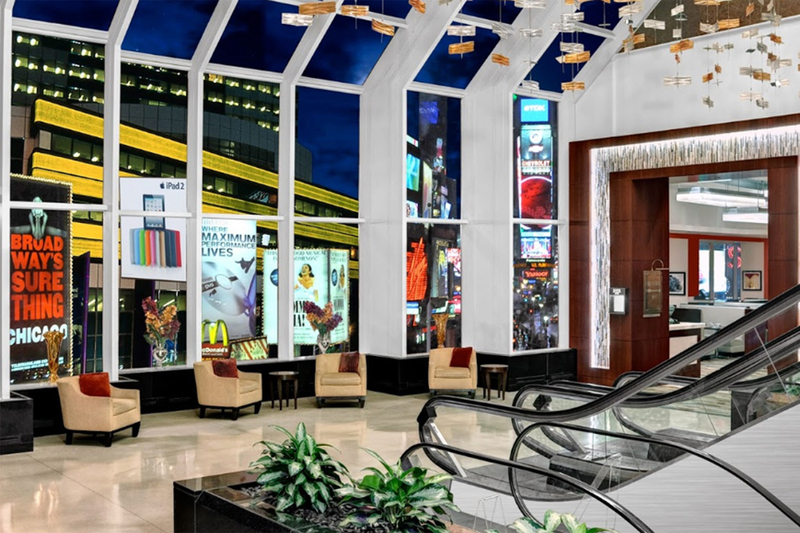 Stay right in the middle of it all at the Novotel Times Square, where all the tourist-friendly offerings of midtown Manhattan, from shopping to Broadway shows, are literally right outside your door. You can bring one pet smaller than 50 pounds for no additional fee, but you will have to sign a waiver in case of any damages to the room. 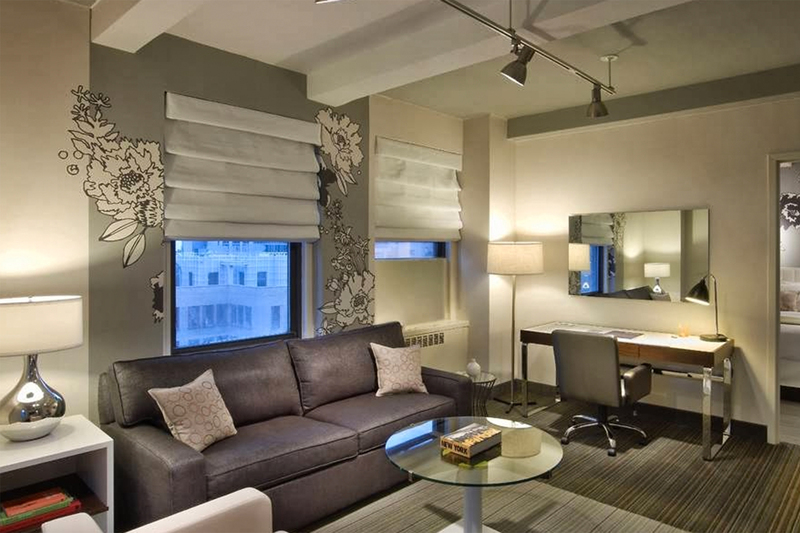 226 W 52nd St between Broadway and Eighth Ave (212-315-0100, novotel.com).